For other uses, see The Rivals (disambiguation). 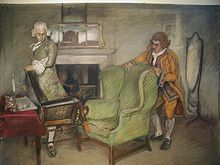 The Rivals is a comedy of manners by Richard Brinsley Sheridan in five acts which was first performed at Covent Garden Theatre on 17 January 1775. The story has been updated in numerous adaptions, including a 1935 musical in London and a 1958 episode of the television series Maverick, with attribution. The Rivals was Sheridan's first play. At the time, he was a young newlywed living in Bath. At Sheridan's insistence, upon marriage his wife Eliza (born Elizabeth Linley) had given up her career as a singer. This was proper for the wife of a "gentleman", but it was difficult because Eliza would have earned a substantial income as a performer. Instead, the Sheridans lived beyond their means as they entertained the gentry and nobility with Eliza's singing (in private parties) and Richard's wit. Finally, in need of funds, Richard turned to the only craft that could gain him the remuneration he desired in a short time: he began writing a play. He had over the years written and published essays and poems, and among his papers were numerous unfinished plays, essays and political tracts, but never had he undertaken such an ambitious project as this. In a short time, however, he completed The Rivals. For my own part, I see no reason why the author of a play should not regard a first night's audience as a candid and judicious friend attending, in behalf of the public, at his last rehearsal. If he can dispense with flattery, he is sure at least of sincerity, and even though the annotation be rude, he may rely upon the justness of the comment. Sheridan also apologised for any impression that O'Trigger was intended as an insult to Ireland. Rewritten and with a new actor, Clinch, in the role of O'Trigger, the play reopened on 28 January to significant acclaim. Indeed, it became a favourite of the royal family, receiving five command performances in ten years, and also in the Colonies (it was George Washington's favourite play). It became a standard show in the repertoires of 19th-century companies in England and the US. The play is now considered to be one of Sheridan's masterpieces, and the term malapropism was coined in reference to one of the characters in the play. She was first played by Jane Green. Lydia Languish, a wealthy teenaged heiress, in love with "Ensign Beverley"
The play is set in 18th-century Bath, a town that was legendary for conspicuous consumption and fashion at the time. Wealthy, fashionable people went there to "take the waters", which were believed to have healing properties. Bath society was much less exclusive than London, and hence it provides an ideal setting for the characters. The plot centres on the two young lovers, Lydia and Jack. Lydia, who reads a lot of popular novels of the time, wants a purely romantic love affair. To court her, Jack pretends to be "Ensign Beverley", a poor army officer. Lydia is enthralled with the idea of eloping with a poor soldier in spite of the objections of her guardian, Mrs. Malaprop, a moralistic widow. Mrs. Malaprop is the chief comic figure of the play, thanks to her continual misuse of words that sound like the words she intends to use, but mean something completely different (the term malapropism was coined in reference to the character). 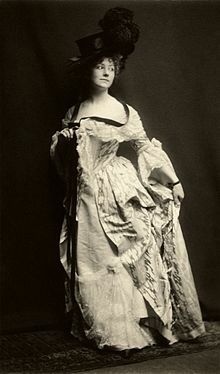 Elsie Leslie as Lydia Languish in The Rivals, 1899. Photograph by Zaida Ben-Yusuf. Bob Acres tells Sir Lucius that another man ("Beverley") is courting the lady of Acres' choice (Lydia, though Sir Lucius does not know this). Sir Lucius immediately declares that Acres must challenge "Beverley" to a duel and kill him. Acres goes along, and writes out a challenge note – despite his own rather more pacifist feelings, and the profound misgivings of his servant David. Sir Lucius leaves, Jack arrives, and Acres tells him of his intent. Jack agrees to deliver the note to "Beverley", but declines to be Acres' second. David informs Mrs. Malaprop, Lydia, Julia, and Sir Anthony of the duel, and they all rush off to stop it. Sir Lucius explains the cause of his challenge, but Lydia denies any connection to him, and admits her love for Jack. Mrs. Malaprop announces that she is Delia, but Sir Lucius recoils in horror, realising that he has been hoaxed. Sir Anthony consoles Mrs. Malaprop, Julia is reconciled to Faulkland, and Acres invites everyone to a party. A successful musical production of The Rivals with songs by Herbert Hughes and lyrics by John Robert Monsell was staged by Vladimir Rosing at London's Novelty Theatre in September 1935. The Novelty Theatre had a few other names but was demolished in 1941 as Kingsway Theatre. Queen Mary attended one of the performances. The play was rewritten as a 1958 episode of the television series Maverick, starring James Garner and Roger Moore, and was the only episode of the series in which Garner and Moore appeared together (Moore did not play "Beau Maverick," Bret Maverick's cousin, until after Garner had left the series). Patricia "Pat" Crowley portrays the leading lady. The episode was called "The Rivals" and the original playwright was given due credit. The play was adapted for Australian television in 1961. The BBC produced a version which was broadcast in 1970 as part of their Play of the Month series, starring Jeremy Brett as Captain Jack Absolute. The leading character of the play was taken to be the identity of the hero of a series of historic fictional adventure books by actor/novelist Chris Humphreys. They take place in Cornwall, London, Quebec, the American colonies during both the Seven Years' War and the American Revolution, and Portugal. Richard Brinsley Sheridan, The Rivals (New Mermaids 1979, Elizabeth Duthie, Ed.). Linda Kelly, Richard Brinsley Sheridan, A Life (Sinclair-Stevenson 1997). Brooke Allen, The Scholar of Scandal, a review of Fintan O’Toole, The Traitor's Kiss: The Life of Richard Brinsley Sheridan, 1751–1816 (Farrar, Straus & Giroux 1998), at New Criterion. Richard Brinsley Sheridan (1751–1816) at Theatre History. ^ The Dramatic Works of Richard Brinsley Sheridan at the Internet Archive. Oxford University Press 1930. Introduction by Joseph Knight p10. Retrieved 28 June 2013. ^ Rosing, Ruth Glean. Val Rosing: Musical Genius. pg. 123, Manhattan: Sunflower University Press (1993). Wikimedia Commons has media related to The Rivals.